Michael Bennett could be playing elsewhere in 2019. Heading into the 2018 regular season, both the Philadelphia Eagles and Jacksonville Jaguars were thought to be among the best teams in their respective conferences. That has not been the case so far, as the Eagles have let two games they had in hand slip away, while the Jags have been outscored 90-28 in their last three games. Both teams sit at a very disappointing 3-4. The Jaguars don't hide the fact that they want to run the football. They have built their roster in something of an old school fashion in which they want to pound the run, and play great defense. In 2017, they ran it more than any other team in the NFL, in terms of run-to-pass ratio (49.5 percent). Because they have played from behind in so many games so far in 2018, they are running it on just 35.3 percent of their plays. That is not who they want to be. "I've got a lot of respect for Doug Marrone," said Jim Schwartz on Tuesday. "He's a football guy through and through. He's a Bill Parcells disciple. He's a tough-minded guy. He took a lot of flak, I think it was last year, somebody asked him, maybe it was this year -- I get confused. Somebody asked him what his ideal run-to-pass ratio was and he said 100 percent, and that tells you all you need to know. He was an offensive lineman, played a little bit in the NFL, played major college football, and there's a toughness and an attitude to that. "I think that's where they would like their team to be. That's what carried them to the AFC Championship Game last year. They got a couple tackles hurt. They got their tight ends hurt. They lost their running back. Changes your running game a little bit and I think they are still trying to find that." Against the Eagles, as Schwartz mentioned, former No. 4 overall pick Leonard Fournette will be out, as he's been for most of the season. Also, as noted by Schwartz above, the Jags have had OL injury issues, most notably losing starting LT Cam Robinson for the season with a torn ACL. The run game has not been a problem for the Eagles this season. They have been killed by big plays in the passing game, and have felt the effects of downright bad coverage by the outside corners. Still, they cannot afford to let the Jaguars get their run game going, and into their comfort zone. This is perhaps a rare game where it is preferable for their opponent to try to throw it. As noted above, the Jaguars lost starting LT Cam Robinson for the season with a torn ACL. Filling in for him initially was Josh Wells, who then injured his groin. The Jags placed Wells on IR, and signed former Giants bust Ereck Flowers. Over the last two games, the Jags have started Josh Walker at LT. Walker is a former undrafted guard who has bounced around the league, and had never previously started an NFL game. He has not been good, as you might expect. To be determined if the Jags stick with Walker, or if they give someone else (Flowers, maybe?) a shot. 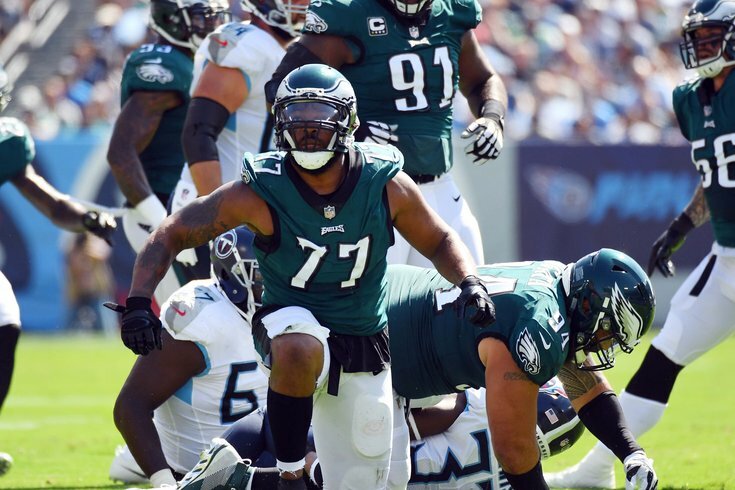 With the loss of Derek Barnett for the season with a shoulder injury, Michael Bennett will fill in as the starting right defensive end. This season, there's an argument to be made that Bennett has been the Eagles' most disruptive edge rusher. This is a matchup that a veteran like Bennett must dominate, and if the Jaguars slide protection his way, the rest of the Eagles' defensive line must capitalize on their one-on-one opportunities. In 2018, the Jaguars are 20th in the NFL with 15 sacks. That puts them on pace for 34 sacks this season, which is a far cry from the 55 sacks they had in 2017. But make no mistake, the Jaguars' don't lack talented pass rushers, particularly on the edge. In 2017, Ngakoue had 12 tackles and a league-high 6 forced fumbles. Campbell had 14.5 sacks and 3 forced fumbles. This season, their production is down, mainly because the Jags have played from behind in most games. They haven't been able to pin their ears back and get after the quarterback. Still, Ngakoue and Campbell have 4 sacks apiece. A season ago, Johnson was the best offensive tackle in the NFL, and Peters was excellent before he was lost for the season with a torn ACL. This season, both Johnson and Peters have battled through injuries. Johnson has dealt with an ankle sprain, while Peters has played through a torn bicep and quad injury. They haven't looked anything like what they were a year ago. This is a huge matchup between struggling star offensive tackles and likely frustrated-but-hungry star defensive ends. Of course, if guys like Ngakoue, Campbell, or defensive tackles Malik Jackson or Marcel Dareus are able to get to Wentz, he must do a better job hanging onto the football. In each of the five games Wentz has started this season, he has at least one fumble, and six total for the season. "We emphasize it and we talk to him about it, and obviously pocket security is really important and he understands that," said Mike Groh on Tuesday. "We're obviously not tackling in practice, so it's one of those things that you just have to continue to emphasize until you get the results that you want." The fumbling issues aren't new. In 34 career starts, Wentz has 29 fumbles. To note, some of those are bad snaps or mishandled handoffs by the running back that fall on Wentz in the stat sheet, but there have certainly been plenty of occasions in which Wentz's ball security has been questionable. The Jaguars are last in the NFL with one forced fumble this season. That's an anomaly. Wentz's ball security issues must be a coaching point of emphasis this week against a ball-hawking Jaguars defense that forced 17 fumbles in 2017. The running theme of the Eagles' defense this season has been the Birds' susceptibility to the deep ball. While the Jaguars don't have a stud receiver like a Julio Jones or an Odell Beckham Jr., or even a quarterback who has shown that he can consistently push the ball down the field with accuracy, they do have a bunch of guys with a lot a speed. Dede Westbrook (4.39), Donte Moncrief (4.40), and D.J. Chark (4.34) can all get down the field in a hurry, while Keelan Cole, who is perhaps the Jags' best receiver but who doesn't have blinding speed on paper, has a career yards per catch average of 16.0. In other words, the Jags are capable of threatening opposing defenses deep down the field, and the Eagles have mostly been unable to prevent big plays from happening.